Anne van Schothorst likes to improvise on well known Jazz standards and Traditionals. She is also dreaming behind her harp; intuitive instant music will arise with an original free sound. The music is especially suggestive for the listeners fantasy. Anne has 44 strings available. These are as it were three instruments. The harp is the rhythm, base and melody. To Anne it is very challenging to express the versatility of the harp as a solo instrument. This delicate, sensitive instrument can be played with Soul. Harpist and composer Anne van Schothorst has developed during the years an authentic and unique style. She plays the harp with strength and sensitivity. It is extraordinary that she writes her own repertoire. Through a simple note score Anne creates dynamics and depth into her compositions. In her art work she applies audio visuals. The combination of harp music and other arts are very inspirational to Anne. For example she has made a DVD with artistic images and harp music. Some of the compositions could be heard on the classical Dutch radio stations. Anne van Schothorst has recorded a sympathetic CD last year. Original music and improvisations give a meditative atmosphere. The CD is related to the New Age music style. It brings simple repetitive melodies, sometime even mystical. The motives are like mantras. Sound of nature give the CD a tone of reflection and meditation. 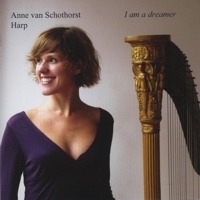 The CD of Anne van Schothorst offers a small hour pleasant and relaxing harp music. Compositions arise sometimes during improvisation. Dreaming behind my harp is to me the ultimate musical freedom. That is why I play originals and I trust my intuition. Also some well known pieces (classical, jazz, trod.) are very inspiring to improvise on.